This scrumptious noodle recipe 'Pad Thai Gai' is the real deal - a version of famous Pad Thai (only easier!) direct from Thailand. 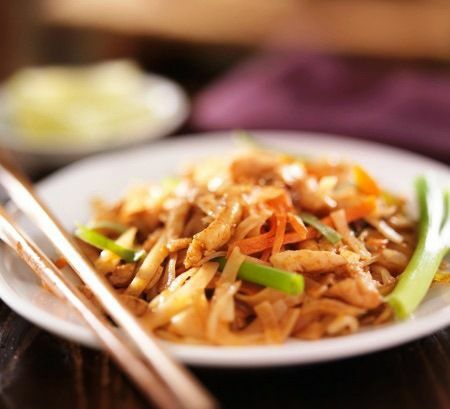 It features stir-fried rice noodles with chicken in a tangy sauce along with toppings of chopped nuts and basil. The noodles are stir fried until they have that famous Thai sticky/chewy taste. You'll love the sweet-sour balance of flavors along with the comforting combination of chicken and noodles. This easy, everyday dish is sure to bring a smile to your face. Boil rice noodles until too tough to serve but soft enough to eat - a firm "al dente" (noodles will finish cooking when you fry them so avoid overcooking at this point). Drain, and rinse with cold water to keep from sticking. Stir all "stir-fry sauce" ingredients together in a cup. Drizzle 2 tablespoons of sauce over the chopped chicken, and stir. Heat a wok or large non-stick frying pan over medium-high heat. Drizzle in oil, and swirl around then add garlic. Stir fry 1 minute. Add chicken, and stir fry 2 minutes. Add carrot/cabbage, drizzling a little more stir-fry sauce into pan if it becomes dry. Push ingredients aside, and crack egg into the middle. Scramble quickly, and incorporate with other ingredients. Add noodles and 1/4 of the stir-fry sauce, using two utensils to lift and turn them in the pan. Stir fry 30 seconds, and add more sauce, continuing in this way until most of the sauce has been used. Add bean sprouts and continue stir-frying another 2-3 minutes. Taste-test and add remaining sauce if you'd like more flavor. Add a little more fish sauce for even greater depth of flavor. Serve topped with chopped nuts, spring onion, and fresh basil. Garnish with lime wedges and squeeze over just before eating.